Mexico posted its highest homicide rate in decades, with the government reporting Sunday there were 29,168 murders in 2017. The number is the highest since comparable records began being kept in 1997 and is also higher than the peak year of Mexico's drug war in 2011, when there were 27,213 murders. The Interior Department, which posted the number, reported the country's homicide rate was 20.5 per 100,000 inhabitants in 2017, compared to 19.4 in 2011. But Mexico security analyst Alejandro Hope said Mexico's murder rate is probably higher than the Interior Department statistics show, because the department does the per 100,000 count based on the number of murder investigations, not the number of victims, and a killing may result in more than one victim. Hope says the real homicide rate is probably around 24 per 100,000. Despite U.S. President Donald Trump's tweet last week claiming Mexico is "now rated the number one most dangerous country in the world," there are several nations in Latin America with higher rates. Brazil and Colombia had about 27 homicides per 100,000 inhabitants, still well below Venezuela's 57 per 100,000, according to a World Bank report. El Salvador reported a rate of 60.8 for 2017. In 2016, the most recent year for which figures are available, Canada had 1.68 homicides per 100,000 inhabitants or 611 homicides, according to Statistics Canada, while the United States had 17,250 homicides or 6.8 per 100,000, according to the Federal Bureau of Investigation. Several U.S. cities — including St. Louis, Baltimore, Chicago, New Orleans and Detroit — had higher rates. But some parts of Mexico were singularly violent: The Pacific coast state of Colima had a rate of 93.6 murders per 100,000 inhabitants; Baja California Sur, home to the resort town of Los Cabos, had a rate of 69.1; and Guerrero, home to the resort town of Acapulco, had a rate of 64.2. While President Enrique Pena Nieto had campaigned on a pledge to end the violence that occurred during his predecessors' 2006-2012 offensive against drug cartels, there was only a temporary drop in killings between 2012 and 2014. By 2015, killings began rising again, and 2017 was the bloodiest year, probably since the early 1990s. 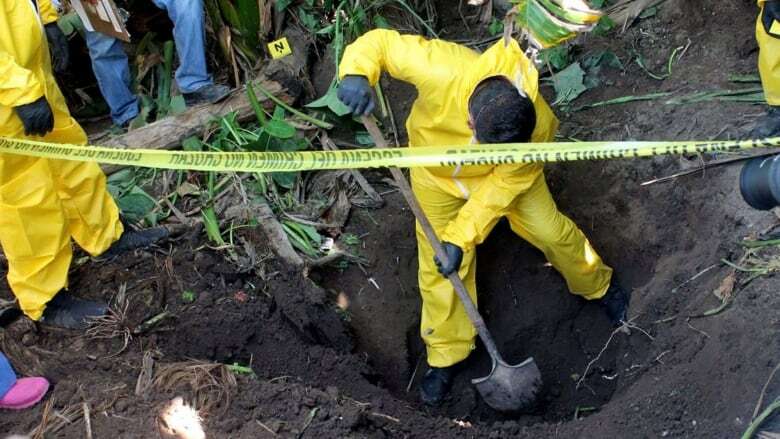 This year promises to be even bloodier: During the first few days of 2018 in just the Gulf coast state of Veracruz, nine people were killed, dismembered and had their body parts stuffed into a van in the state capital of Xalapa. The grisly scene — literally a jumbled pile of human limbs and torsos topped by a threatening note apparently signed by the Zetas drug gang — was reminiscent of the mass dumping of bodies in the state in 2011. Earlier in the new year, five severed heads were found arranged on the hood of a taxi in the tourist town of Tlacotalpan, Veracruz, and four others found in another city in the same state. Experts say drug violence and other factors, such as bloody turf battles sparked by the expansion of the Jalisco New Generation cartel, played a role in Mexico's rising murder rate. But Hope says the problem is complex. "The violence in Mexico has many causes. Drug trafficking is one of them, of course, but it is not the only one," said Hope. "There are social triggers, institutional ones, historical ones, issues of land rights. It is complex." In fact, Hope argues, the period from 1997 to 2007 — when murder rates in Mexico plunged to as low as 9.3 murders per 100,000 — was in fact the exception. "What we have seen in the last decade is regression to the mean" that prevailed throughout much of the 20th century, he said. "The anomaly is the decade before this one." Hope says murder rates now are about where they were in the mid-20th century. "The violence was different then, no doubt, but your possibility of being murdered in the 1930s was considerably higher than it is now."